It is for the most part as unacceptable to do your thinking in book reviews as it is to review books that make you think. 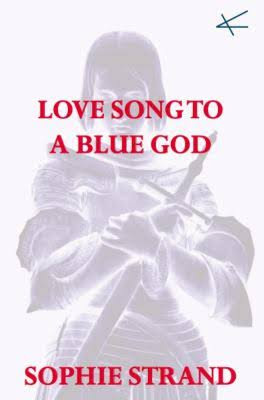 Woe to those zombies who would find a book like Sophie Strand’s debut collection of poetry, “Love Song to a Blue God.” It keeps me awake: attracts my attentions; thoughts and parallels coalesce around it; it wakes me, and the world that was dead wakes with it. So, she’ll speak, and I’ll give running commentary. spaces left behind by street lights. body too vast to ever understand. of sensation imposed by light dissolve. oak tree, the water in the quarry. through another eye. Sometimes I see the eye. it would take to ask this question? would have been a better divination. with a sign. This is a consequence of getting born. a red-tailed hawk appears repeatedly on fences, telephone poles. of my own nose reflected every time I turn towards a window. my pocket, lean my neck against the breeze. the cards pulled will only ever spell my name. There is no Joan in this poem, but the poet would herself say she was Joan, or any other instantiation of that impulse; as she says: the cards pulled will only ever spell my name. That is: I’ll be Joan or anyone else, because anyone else is me. Something Christ, too, would say, by way of “re−involving the syntagma into the inner.” Christ, too, had a “negative existence,” which spoke, “standing forth from itself;” what he humbly called the heart. Strand has made me think that what she calls Joan is our bodily emergence as the reincarnation of Christ. Or if you prefer, the “Christ impulse.” All ways, through all time, we go preparing the way of the Lord: our peculiarities, our particular and personal suffering bodies give way to their leading archetypal motions, preparing the way of the Lord, so to speak, while also reaffirming the Lord that leads them as an aspect of our species, as an aspect of the language which is not just language but resonates more deeply and projects further than we’re allowed to know. Christ. John. Joan. Crying in the wilderness. They perish, and come forth anew. Cycle. From their feedback Strand generates novel archetypes and our ever-new Joans walk forth: stretched, suffering on the demands she’s made, or finds made for her, a suffering which resonates and with its feedback empowers the glorified, ritualized cause of this pain, that is a rarefaction. In one Christian vision of martyrdom the generative spirit incarnate finds transcendence through the consummation of the body. But Strand’s Joan doesn’t die naively as a mere martyr, she is consumed in the way of digestion, as food in the world-organism in whose history she represents a unique incarnation. Her consumption provides a nexus for the truth: so while herself no longer reifying, no longer bound; her consumption is the climax of a ritualization of cosmology, which is to her literal vanishment and return into possibility, a variety of magical adornment. The jewels of debility. Joan, consumed, redounds. even now there are things I cannot explain to you. I have no source. it comes when I am outside and always from the left side. I will not tell you more than that. no, pass over. the red dress, skirt to the foot and with long sleeves, becomes a symbol for a time in my life before god. before god the fields were their wildflowers. I was never terrified, or only very rarely, by my father: the white bulb of his nose so like the stones at the edge of the oak forest. the red dress went better with the beech trees. its hem never tangled in vine. I was never tangled in this time. every light seen was seen by everyone; it was the sun or the candle of my brother come to call me inside from the garden. I saw the same things as anyone, the priest heard my confession and grew tired. a word is the smallest offense against the vacuum, the church is only for holidays, he instructed. I should continue confessing, but not to him; I should tell the trees. in the alphabet of my country, the red dress occurs somewhere between J and X. It cannot be said but is heard in every word. even the word for war lives somewhere in the pleats, touching its secret metal like a zipper that is sewn so as to be unseen. J represents the sound of my name when it names another. many girls own the same name, the same sound, the same dress. the X is a sign I make on paper when I believe I cannot bear the sight of a lit fire. this language is something I did not inherit from my mother or my father. they are good people and speak plain French. this is not in tongues, although I have been accused of this skill; my words are easily understood, often exactly a “field” or “crown” or “angel”. only later do I speak in figures. impossible to explain to an audience of stones, dressed as men, what a thousand scintillas of dust look like when they separate from the air in order to communicate the fate of a nation. see: even now I fail and the dust returns to its hiding spot behind its requisite molecule of oxygen. a vision cannot be repeated. there are some things that do not have a proper noun. I will not attempt to share. pass over. it has been a long day and the dress you have given me is the wrong color. it is for this reason alone, no great thunder of metaphysics, that I once again relapse in my chamber. pass over. I do not have to explain. the hills were resilient with unmeaning. they bore my feet when I led the cows out in the morning and then returned to their original texture. there is a word for how badly I want to return home. I cannot speak the feeling of visiting my favorite shrine after all this time. I would bend down, fold my skirt, touch my fontanel to our lady’s own stone skirt, so different from the stone men. and then home for dinner and all my uncles come to drink too. I think, having seen blood and been a long time separated from my things – two gold rings, a dress, my own hair – I might sit quietly and refuse wine. pass over. this cup is not for me. it is not easy when the voice comes and then a light the size of a coin in my left eye. an X on the right hand of the page could have bought me a vital language. but I quickly erased it, knowing full well, it was the letter closest to meaning my red dress. how carefully I would wash its skin, saving the bones of the bodice for last. I did not often wash and am now so very dirty. perhaps now the dress prove too small; built for the brightly lit world of a child. I am older now. there is a better word for its color. red being something like a dead river filled with every year of the war. there is a word that better describes the dress and that word is fire. A little after these words, that were spoken in my heart by the tongue of Love, I saw coming towards me a gentil donna, who was a famous beauty, and formerly the much loved lady of my best friend. And the name of this donna was Giovanna, save that because of her beauty, as some credit, she was given the name Primavera (Spring); and such she was called. And so she came, leading, and I saw coming behind her the miraculous Beatrice. Strand does what she needs to do, what we need to do. Does it herself, uniquely, and glorious is her song. Tamas Panitz lives in Catskill NY, where he writes and edits The Doris magazine with Billie Chernicoff. He is the author of Blue Sun (Inpatient Press); Uncreated Mirror (Lunar Chandelier), and the forthcoming Upper Earth (Oread Press). He also edited Pierre Joris' An American Suite (Inpatient Press).